Deciding which fence material is right for you can mean extensive research. Let’s start you off by talking about vinyl fences. So, you want to install a fence. The material you want to build it out of is probably the biggest choice you’ll make; it involves considering many factors. From climate to maintenance ability, each fence material makes for a different experience. Deciding which one is right for you can mean extensive research. Let’s start you off by talking about vinyl fences. How can they benefit you? Why are they so popular? Read on to find out. Because of the material, vinyl fences are extremely easy to clean and rarely require maintenance in the way wood fences or aluminum fences do. They last for a very long time, and aren’t susceptible to rot. For those who don’t feel like they have the time to maintain a fence, this is a great option. And, in especially moist climates or homes closer to water bodies, vinyl is much easier to look after. Vinyl almost always looks impeccable. For this reason, it increases the curb appeal and aesthetic of your home. Fences in general tend to raise home value, so a vinyl fence looking beautiful and flawless is a great way to get your home looking its best. Future homeowners will also be just as attracted to the idea of a maintenance-free fence. Due to lack of maintenance needs and an added curb appeal, your fence will inevitably gain you more money that it initially costs. You’ll save money on maintenance equipment, and ultimately, you’ll receive more when you sell your home. 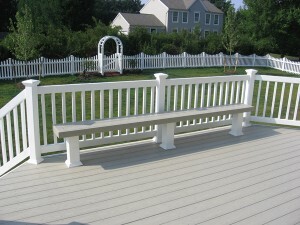 Install your beautiful new vinyl fence with Mid Atlantic Deck & Fence! Mid-Atlantic Deck & Fence has almost 30 years of experience in building beautiful custom fences, gazebos, and decks throughout the state of Maryland. We have the expertise to design your dream fence or custom deck and have it installed in a headache-free process. Give us a call at 1-800-833-9310 or visit us online for a quote today! We offer many different styles of fencing and decking in addition to custom options designed specifically to suit your preferences and tastes. To see examples of our work and get more tips on how to choose the right fence for your family, follow us on Facebook, Twitter, Houzz, Pinterest, Google+, YouTube, and LinkedIn.